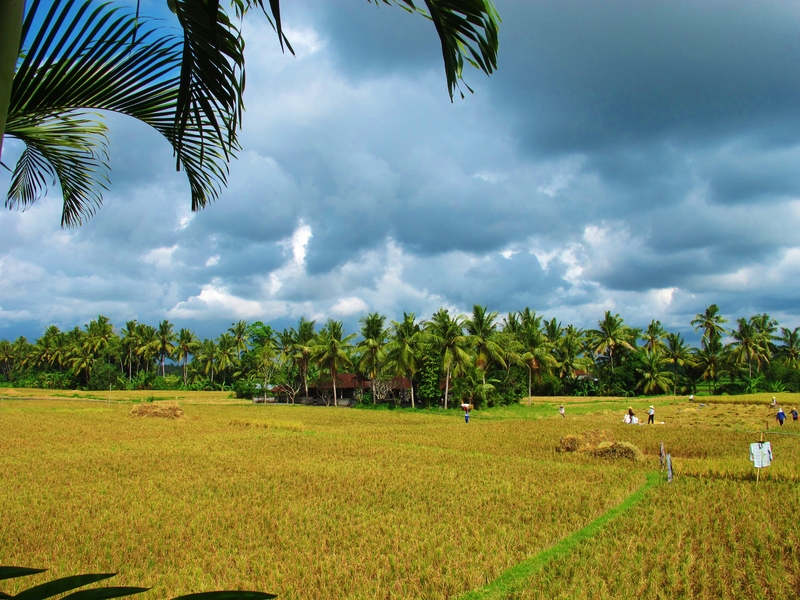 Views from our accommodation in Ubud – these rice fields held a good range of birds including Javan Kingfisher, Golden-headed Cisticola, and three species of Munia. Our first priority after a very hectic wedding fortnight, and a long four-flight journey from the south of France, was to relax. Fortunately we had chosen just the right spot for our honeymoon accommodation, a traditional Balinese villa with an infinity pool, overlooking tranquil rice fields, about ten minutes to the south of town. I was last in Ubud in 2007, and I had fond memories of a quiet little village surrounded by country roads and peaceful rice fields. Not any more – Ubud is now a busy town with an enormous range of accommodations and tourist services, and a burgeoning traffic problem. Modern coffee shops, art galleries and designer boutiques crowd the main streets. The restaurant scene is now eclectic, sophisticated and very healthy, much to the delight of my vegan uber-health-conscious wife. I wondered whether I was going to see any birds here, as initial forays into the countryside on my rented scooter revealed urban sprawl and construction projects stretching for many miles all around. I needn’t have worried, as during our extended stay here I was able to see almost all of the expected Ubud birds. Top billing goes to the pair of Java Sparrows around our accommodation early one morning. At one time common throughout Bali, this beautiful bird is now very rarely seen in areas where it was once abundant. It is listed as Vulnerable on the IUCN Red List of Threatened Species, and according to birding trip reports is not often seen anywhere these days. The spectacular Javan Kingfisher is endemic to Java and Bali, and is another speciality of the Ubud area. I had a handful of sightings during my visit, although for such a large and colorful bird it can be elusive and I probably heard it ten times for every one actual sighting. Munias were everywhere in the rice fields, mainly Scaly-breasted, with smaller numbers of the endemic Javan Munia, and a handful of smart White-headed Munias. Both Zitting and Golden-headed Cisticolas were present in the rice fields, but I had just one sighting of Streaked Weaver. Ubud lifers: Cave Swiftlet, Streaked Weaver, White-headed Munia, Javan Kingfisher, Java Sparrow.